Happenstance, it is a relief that I was not around Glasgow in Scotland, earlier. Had I been, I may have punched some jaw and landed up for assault. That I was 6000 miles away from Glasgow, sitting in steaming humid Karachi, partaking of cups of tea, did not reduce my irritation. Because that very cup of tea (my last surviving vice) had been declared void and out of bounds. And no, I am not talking about some office economy drive to cut costs, by banning tea at the workplace. The lords of scientific research had declared tea as carcinogenic for the male species of the human race. All hell must have broken loose in Darjeeling and Sri Lanka! My relationship with tea goes back to my earliest memories. I remember, sitting on what is called a moundha – a small stool – with a buaa and having tea in the kitchen. Distinctly remember it being out of a Pyala. Yes sir! A good old Pyala. And I insist on calling it that, as a bowl takes all the charm and nostalgia out of the occasion. How do you describe a Pyala? Well its deep, its big, made from china, very colorful on the outside and ugly as hell. What a self respecting 3 year old was doing, partaking of sweet tea in a hot kitchen, I have no idea. Suffice it to say I survived, and now these so called researchers from Glasgow say I was wrong and that I should not have? 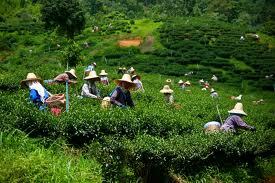 Anyway the story of tea begins in British times and really earlier in China. But the influence on us came through the British. The first known reference to tea in Britain is by Samuel Pepys, in the 17th century. Pepys must have been a popular author, because soon it was one of the biggest trades of the East India Company. Along the way sugar and milk were added to tea and nonsensical mythology prevails on how this happened. By 19th century the higher social echelons were so enamored that they named the afternoon light meal after the drink, courtesy the Duchess of Bedford. This society icons indulgence was eventually also incorporated into the game of cricket. So you had these Lords and Ladies partaking tea, while playing cricket on the village green. Utter bliss! Quite incredible that tea is also credited with two wars. By 1773 American colonists were heartily sick of the beloved King and his taxes. As part of their rebellion, one night some enterprising men emptied lots of crates of tea into Boston Harbor, as a protest against these taxes. Sounds familiar! It became known as the Boston Tea Party and was the first step towards the American Revolution. Today the rather conservative mutant, the modern Tea Party derives its name, if not its philosophy, from these legends. The second war is what led tea to India and so to my Pyala. The British importing tea from China would pay for it by exporting opium to the country. When this was declared illegal, it led to the Opium Wars. Eventually they introduced tea plantations into India as an alternative and so for over a century India became the highest seller of tea in the world. Thus was born the local usage of tea, with many rituals added to it today. Returning to my own story of tea; I was a chai khor. No other word for it. A delight for corporates like Lipton and Brooke Bond. Nevertheless, when I landed up in the UK, it was fascinating that they drank even more tea, but yet found the need to campaign on TV. The advertisement tagline “Tea, Best Drink of the Day” meant even more cups consumed. Returning to Pakistan, fate took me to another tea company Unilever, with Lipton tea in tow. “Chai chaheyay; kaun see janaab” was of course their famous advertisement. One learnt of how Lipton samplers would take a ‘gadha gari of chai‘ and go from Karachi to Peshawar making tea, village to village and creating the tea habit. Trust corporates to fan bad and expensive habits. So no wonder, my attachment to tea seems to be written in stone. Then occurred the last fateful encounter with tea. Sonay par sohaga! When Engro Foods commenced its business, over time we learnt that segmentation of dairy usage had occurred. A high incidence of milk usage was in tea. Pakistanis love to breakfast on chai and paratha/roti. We launched Tarang and it became the leading dairy industry brand in Pakistan. “Chai ka sahi jor” is probably the most famous tagline used in Pakistan. Coupled with filmi images of Saima, Sana and Moammar Rana, we have ended up annoying a lot of conservative people, in the name of commercialism. Now I sit and wonder whether to drink this beverage. All this history of association with tea and enjoyable cups – especially the post meal ones – and then to have the carpet suddenly pulled from under ones feet, by a couple of research nerds, who remain faceless, is the outside of enough. For me tea is an association with a past trundling through childhood, to England, endless cricket on Sunday afternoons and then a commercial career, which relied heavily on Tea being the Best drink of the day. Is nothing sacrosanct in this new world of ours? Next they will take away nihari and pa-aye. A tag line that jolted the memory. Very nicely written. Thanks.